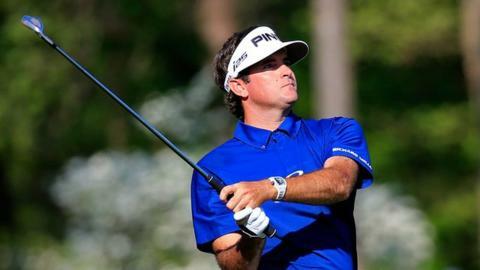 Former champion Bubba Watson and debutant Jordan Spieth will take a one-shot lead into the final round of the Masters at Augusta. Watson struggled to a two-over 74 while Spieth, 20, shot 70 to set the pace at five under on a baking day in Georgia. Spieth can eclipse the mark of the absent world number one Tiger Woods, who won his maiden Masters aged 21 years three months in 1997. Matt Kuchar hit 68 to reach four under alongside Sweden's Jonas Blixt (71). Rory McIlroy took 71 to move up to three over, while defending champion Adam Scott slid to one over after a 76. "It's been an absorbing day, thoroughly enjoyable. There have been storylines everywhere. It is the day that the 78th Masters came alive. The nature of major championship golf is that the first two days can be a real grind, but the authorities know what they are doing when they set up the course." Spain's Miguel Angel Jimenez, 50, shot the round of the week, a six-under-par 66, to jump to three under with America's Rickie Fowler (67). England's Lee Westwood (70), America's Jim Furyk (72) and Denmark's Thomas Bjorn (73) all ended two under. Only Watson and US Open champions Justin Rose and Furyk of the leading 10 players have won a major. Spieth, the PGA Tour rookie of the year last season, mixed four birdies with two bogeys as he bids to become the first debutant winner since Fuzzy Zoeller in 1979. "It was a day about controlling the nerves and trying to stay as patient as possible," Spieth told BBC Sport. "I'm really surprised how well I did it. "Saturday was the best mental game I've ever had and I'm going to need another one on Sunday. I feel very comfortable on the greens which is very important." Watson, chasing a second Green Jacket in three years, was imperious on Friday to lead by three, but looked shaky in the third round and struggled with his putter, leaving a number of putts short. He dropped a shot at the first but made an eagle at the second after a huge drive and approach to six feet. That took him to eight under but he dropped three shots by the turn to share the lead with Blixt, Bjorn and Kuchar. Watson grabbed the advantage back with a birdie at the 10th after a stunning three-wood off the tee around the corner and second shot to three feet. But he was unable to take advantage of the reachable par-five 13th, three-putting, and could only make par at the par-five 15th. A bogey at the short 16th after his tee shot ended up in the back fringe pegged him back but he managed to par the last two despite catching the trees with his drive on 18. "It was a difficult round. It was the firmest I've seen it in years," said Watson. "But if somebody told me on Monday I'd have 74 and still be tied for the lead I would have taken it all day long." Kuchar dropped a shot at the last to join Blixt, who is playing in only his third major and bidding to become first male player from Scandinavia to win a major title. "Control your breathing. Visualise and remind yourself you've done this thousands of times before. Talk to yourself if it helps. Commit to a spot and a ball flight and let it rip, don't hold back." McIlroy, who made the cut with no room to spare, went off first with Augusta member Jeff Knox as his marker, and was outscored by one shot. Scott, bidding to become only the fourth back-to-back Masters champion, was three behind at the start of the day but went out in four-over-par 40 and was unable to recover. US Open champion Justin Rose shot 69 to inch to one under alongside former champion Fred Couples, who at 54 could become the oldest Masters winner, beating the mark of Jack Nicklaus who was 46 when he won his sixth Green Jacket in 1986. Australian John Senden, playing the final group with Watson also finished one under with Kevin Stadler after rounds of 75 and 72 respectively. The biggest Masters comeback after 54 holes is the eight strokes that Jack Burke clawed back to win in 1956.